Obama, McCain, Graham to continue investigating Russia election hacks. 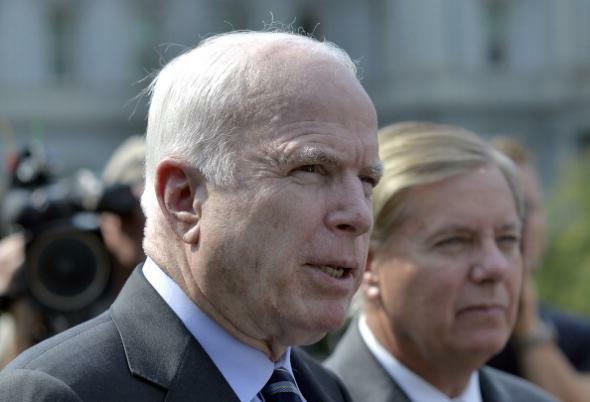 John McCain and Lindsey Graham on Sept. 2, 2013, in Washington, D.C.
One of the more vexing problems Democrats and other Trump critics face is the question of how to actually, like, actually do anything about anything at all given that Republicans who appear ready to roll over and let the president-elect get away with pretty much whatever he wants run both chambers of Congress. Per recent news, though, two of the formal governmental mechanisms that do remain outside Trump/Trump apologists’ control will be used in coming months to investigate the ways in which Russian email hacking and other sabotage may have contributed to his victory. 1. President Obama, one of his top security advisers said Friday, is ordering the American intelligence community to conduct a “full review” of Russian electoral interference to be completed before Trump’s Jan. 20 inauguration. The adviser—Lisa Monaco—said that the review will culminate in “a report to a range of stakeholders, including Congress,” though it’s not clear how much of said report will be made public.